Wall-mounted Glass Marker Board 48" x 34"
Magnetic dry erase boards open up a world of visual management options, but sometimes you're looking for simplicity and elegance. StoreSMART's Wall-Mounted Glass Marker Boards are an attractive, time-tested method of showcasing SMART Boards* and other projected displays, as well as the ideal surface for wet and dry erase markers. Our tempered glass boards won't stain or ghost, while the stainless steel mounting pucks make installation a breeze. For added value, each board comes with a lifetime warranty. For your next presentation, choose a professional display board that makes your work stand out from the crowd. 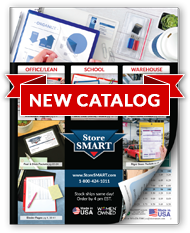 *StoreSMART has no affiliation with SMART Technologies. Board crafted of tempered ¼" (6 mm) glass with 1" radius corners. Board measures 48" x 34". Board comes with a lifetime warranty. Easy installation with heavy-duty stainless steel mounting pucks. Stand-off mounting pucks allow ½" between board and wall. Low profile once mounted; pucks extend only 1" from wall. Mount on light-colored wall for maximum visibility. USB Flash Drive Zip Case - 2 1/8" x 5 1/8"